In the United States, there is a big division between vans and flatbeds. Standard van measurements do vary – so “standard” is a bit of a misnomer. There are also refrigerated (reefer) vans, which have the refrigerated unit attached outside. These vans are using by the frozen LTL carriers. The inside measurements are smaller, even in the “space saver reefer”. There is less head room and a bit less length – so you can’t pack as much in a refrigerated van vs. a regular dry van. The 53’ dry van is a versatile and secure way to move freight. It accommodates more pallets, or more freight in general, than the old 48’ vans which have become obsolete. A forklift can drive onto them and they are high enough to double stack skids. They can be enhanced by E-Track Tie Down Strapping system to keep cargo in place and Lock Bars to prevent cargo from sliding. One disadvantage of a dry van is that it has less capacity than a moving van, which has a dip after the wheels, where you can load more cargo. The extra dip does make the van heavier but moving van cargo is generally lighter than other freight, so the extra space is still an advantage. But, the moving van does require hand packing, since a forklift cannot drive all the way in. 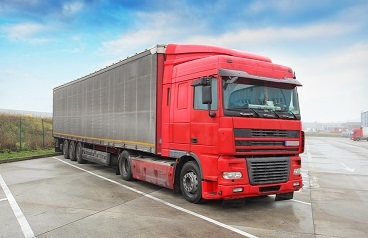 A Logistical trailer is a specialty van that allows for freight to be loaded on a bracket that runs across the width of the truck, like a shelf. Skids or crates can be double stacked, with the weight of the top one supported by the bracket, not by the freight below. There are also moveable floor vans – very expensive – that automatically shift freight forward. This can work with pallets and bulk commodities like wood chips. Straight trucks – usually 20’ to 32’ long - vary by inside width, height and door heights and are typically used for local or express shipments, or to locations that are hard to reach with a big truck. They are also called “hotshots” because they are on “hot loads” that are small but important and time sensitive. Unfortunately, such express truckers do not discount their prices much. Their equipment is less expensive, but the extra labor required by dispatch and the drivers increases their operating costs, and they deadhead empty more often than a standard van does. Flatbeds are trailers with no walls (or top obviously), open to the air. Specialty flatbeds such as lowboys, drop decks or step deck are often used to for extra wide or heavy loads that might even require special permitting from highway authorities. Some flatbeds can be stretched, some have lower decks so they can load tall freight, and some can slide the wheel bases for safer weight distribution. Flatbeds can be tailored to carry specific types of heavy or extra-large cargo, and the cargo can be offloaded by a crane or forklifts from the sides. On the lowboy or Removable Gooseneck trailer (RGN), the front of the trailer can detach to allow heavy equipment to drive or roll off. Such specialty flatbeds can carry all kinds of huge “project cargo” that will not fit inside a van or on a normal flatbed, or under highway bridges. Cargo examples include bridge spans, windmill blades, tanks and pipes. The normal deck on a standard flatbed is 48” high, while the lowboy decks can be as low as 22”. Also note that you can cover flatbed loads with a tarp. Drivers rightfully want to charge extra money for that tarp covering since it is very labor intensive and must be done correctly. The tarp must be secured in place well to keep the freight dry and to keep the tarp from blowing off during the trip. Many flatbed drivers are super experienced, but as the shipper you should check every tie down and inspect tightness all around the cargo to be sure the load is secure. It is a shipper’s legal responsibility to be sure the cargo has been safely stowed, per many court cases. Depending what your needs are, FreightRun.com can make sure you have the right equipment for the job.